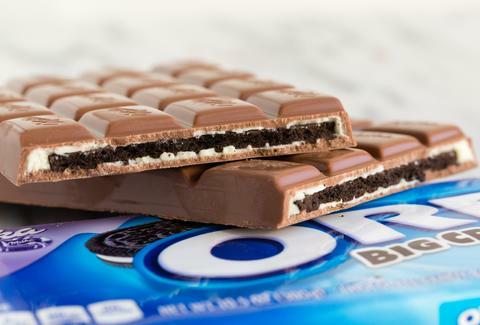 When Oreo unleashed its first chocolate bar in collaboration with German chocolatier Milka last year, one Thrillist writer went so far as to say the candy "may be the single best thing Oreo has ever produced." Now, for the first time since its initial debut, the company is releasing the chocolate bar in a new flavor that's expected to be equally good: mint. Oreo officially released the new flavor from its "Wonder Vault" after photos of the product emerged on social media last week. 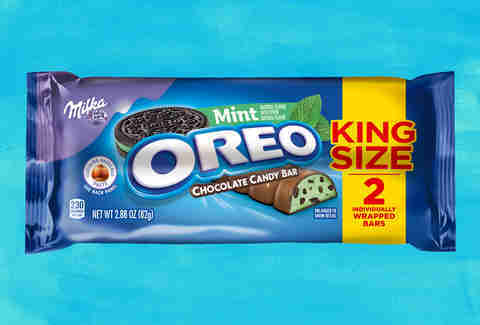 As you may have surmised by now, the new candy bars boast an interior of Oreo cookie pieces mixed with a cool mint-flavored creme filling that's coated with a layer of European milk chocolate. Best of all, you can already find them in stores. A company spokesperson said the new candy bar is "best served ice cold," so you may want to let it chill in your fridge or freezer first if you didn't plan on doing that anyway. The bars are available in two sizes -- 1.44oz and a king-size 2.88oz -- at most retailers with candy sections across the country. Meanwhile, you can still get your hands on the original Oreo candy bar, which features classic cookies and cream flavors, doused in milk chocolate. Between the new chocolate and recently released jars of Oreo cookie dough, good luck deciding which form of the classic cookie you'd like to snack on next time. Nothing will ever beat a regular old Oreo, though. Tony Merevick is Senior News Editor at Thrillist and hasn't had one of the original candy bars in a while now. Send news tips to news@thrillist.com and follow him on Twitter @tonymerevick.